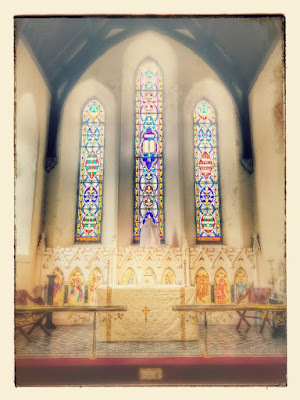 I was in Saint Mary’s Church in Nenagh, Co Tipperary, this morning for the Chrism Eucharist when the Bishop and Priests of the Dioceses of Limerick and Killaloe together renewed our ordination vows. At your ordination to the priesthood, you took authority to watch over and care for God’s people, to absolve and bless them in his name, to proclaim the Gospel of salvation, and to minister the sacraments of his New Covenant? Will you continue as faithful stewards of the mysteries of God, preaching the Gospel of Christ and ministering his holy sacraments? I was ordained deacon in 2000 and priest in 2001, and this was the first time for me to renew these vows in a church other than Christ Church Cathedral, Dublin, and my fist time to do so in the Diocese of Limerick and Killaloe. Like me, the Rector of Nenagh, the Revd Rod Smyth, is a new arrival in this diocese, arriving at the end of last year. Saint Mary’s Church, Nenagh, was built in 1862-1865 to a design by the architect Joseph Welland (1798–1860), and includes a stained-glass window from the Harry Clarke studio in Dublin. The church stands in the shadow of its larger and more ornate neighbour, Saint Mary of the Rosary. It is striking in its simplicity, yet is an interesting example of small-scale Gothic Revival architecture in the mid-19th century. All that remains of the earlier Church of Ireland parish church built in Kenyon Street ca 1700 are some ruins, including a four-stage square-plan tower to the west elevation and the roofless remains of a D-plan lobby to the now-demolished nave. This tower and lobby, set back from the street, are still a notable and dominant structure in Nenagh, and the graveyard retains many old carved stones. By the early 19th century, the earlier church was unfit for use, and the then rector, the Revd James Hill Poe, had the vision for building a new church. The first planning meeting was held on 6 May 1855, and the site was donated by a local lawyer, Carroll Watson. James Hill Poe died in 1859, without ever seeing his dream fulfilled. Work began that September on a new church designed by the architect Joseph Welland (1798-1860), who was strongly influenced by Pugin and the Gothic revival. Saint Mary’s Church. The building is notable for the finely-carved dressings, especially in the voussoirs above the lancet windows. The notable features inside include the stained glass, with one window coming from Harry Clarke’s studio. The church has four-bay side elevations to the nave, a south side aisle, a two-bay chancel to the east end and a projecting porch and a two-stage tower with a spire. There are double lancet windows at the East End, with quatrefoils above and with double pointed-arch windows to the side aisle, with stained glass. The tower has lancet, trefoil and pointed windows. Inside there is an open truss roof, an arcade to the side aisle and a sculptured reredos behind the altar in the chancel. Joseph Welland was architect to the Board of First Fruits and later to the Ecclesiastical Commissioners of the Church of Ireland. He was born in Midleton, Co Cork, in 1798. His father, William Welland, was head agent to George Brodrick, fourth Viscount Midleton. Through the influence of Lord Midleton’s brother Charles Brodrick, Archbishop of Cashel, Joseph became a pupil and subsequently an assistant to John Bowden, architect to the Board of First Fruits. When Bowden died in 1821, Welland may have inherited many of his projects and clients, and he became one of the four architects at the Board of First Fruits, with responsibility for the Church province of Tuam. By 1843, he had responsibility for the whole island. During his career, Welland designed over 100 new churches and altered and enlarged many others. He died on 6 March 1860 and was buried in Saint George’s churchyard, Dublin. His eldest son, Thomas James Welland (1830-1907), later became Bishop of Down, Connor and Dromore, while another son, William John Welland, became an architect to the Ecclesiastical Commissioners. Most of Welland’s drawings for churches and glebe houses are held in the Representative Church Body Library in Dublin. Welland’s designs for Saint Mary’s Church, Nenagh, are for a church with a nave, chancel, south aisle, north and south porches, a vestry room, a tower and a spire. The organ gallery at the west end had a Telford organ, later replaced by an organ built by Nicholson and Ward of Walsall. Welland died before the church was completed, however, and the work was completed by Welland and Gillespie. The total cost was about £4,000, and the contractor was J Hunter of Bandon, Co Cork. The church was consecrated on 19 December 1860 by the Bishop of Killaloe, Ludlow Tonson, Lord Riversdale. At the time, the Nenagh Guardian reported the bishop was present ‘though somewhat feeble of limb.’ He died within a year on 13 December 1861. 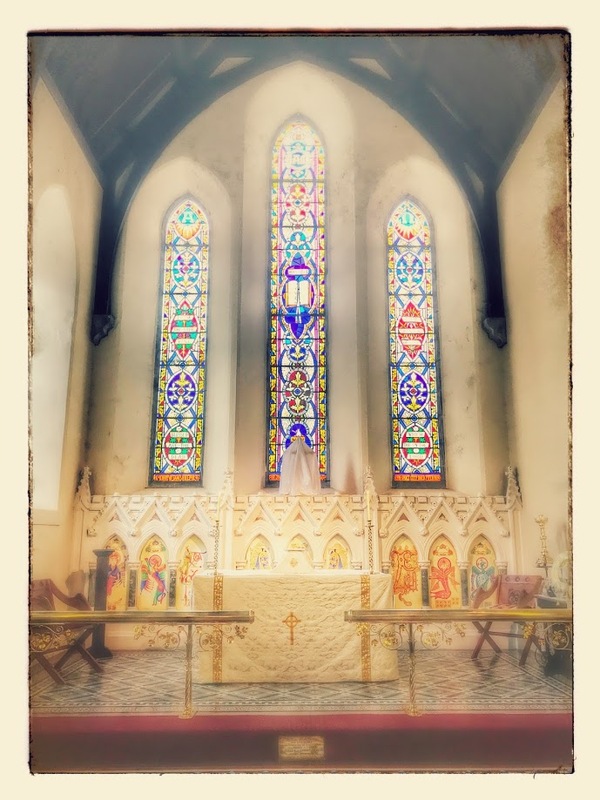 The paintings in the reredos are the work of Anne Towers, whose husband, Canon Patrick Towers, was the Rector of Nenagh (1989-2000). The three-light East window by AL Moore of London is in memory of the Revd James Hill Poe. A window designed by the Harry Clarke studios in Dublin and dedicated in 1971 depicts Christ sitting among children of different ethnic backgrounds, illustrating the theme ‘Christianity embraces all nations.’ It commemorates Michael Kortright, the infant son of Frank and Kathleeen Kortright, who worked in Borneo for many years. While the Revd Sid Morant was the Rector of Nenagh (2000-2004), the roof and much of the interior of the building was repaired and restored, and €230,000 was raised in the local community. Saint Mary’s Church celebrated its 150th anniversary in 2010.